Many thanks to Deb over at Ranch Girl Ramblings for the Best Blog Award! If you haven't been to her blog yet, check it out. It's a fun place to visit! 1. To accept the award, post it on your blog together with the name of the person who has granted the award and his/her blog link. 2. Pass the award to other bloggers that you have recently discovered and think are great! Remember to contact the bloggers to let them know they have been chosen for this award. For the children's writers out there, SCBWI has opened registration for the SCBWI 2010 Winter Conference in New York City! I know we're not all writing kidlit, but here's a question for those of you who are: has anyone been to both the SCBWI Winter Conference in NYC and the SCBWI Summer Conference in LA? This will be my second Winter Conference, but I haven't made it to the one in LA yet. If you've been to both, I'd love to hear how one compares to the other. And now in honor of Halloween, here is something scary for you to imagine: what if there were no SCBWI? It's an SCBWI tribute that Kimberly Baker created for the 2009 SCBWI Western Washington regional conference. Click here...you'll be glad you did. 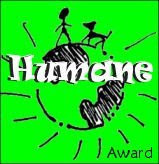 To start off, Stephanie Faris gave me the Humane Award. It was so nice to receive, and I've already added it to my sidebar. Thanks so much, Stephanie! Twice a month we meet at Sheila's house where she babies us and feeds us amazing things she has baked. Have I told you we love her? After a couple minutes of tea and chatting, we get rolling with our chapter critiques. The critiques, brainstorming, and writing talk are why we formed a critique group, but the food is definitely a benny! On the non-Sheila weeks, we meet and critique each other's work. Here's a picture of us last week at a cafe. Bev couldn't make it, but you'd like her. Everybody likes Bev. She's a wonderful lady who adds a lot to our group. Since I write kidlit and have a teaching background, I should mention she has a PhD in Education with an emphasis in Children's Literature. We have fun, and we appreciate each other's support and time. As we all know, the road to publication (and beyond!) is a long one; how nice to go on the journey with friends. Pen names are in the air. Both Roni and Susan have been thinking about them too. And while I'm no expert--mine has been official for less than a week--I do have some thoughts. *It sounds obvious, but pick a name you like. You'll be the one wearing it. *Is the domain name available? *Is there another author with that name? Google it. Even if you find writers, I'm guessing it's not a problem unless they're in your genre or a similar one. For instance, I found a Dawn Simon who is a poet and one who writes medical stuff. No big deal, right? (If it is, please break it to me gently.) Since I'm YA, I also did a search at the SCBWI Web site. *How many people on social networks have the name you're considering? This I failed to look into until after the fact. Imagine my surprise when I learned ONE HUNDRED FORTY-SEVEN people with my pen name have Facebook accounts. You know when your heart starts beating extra fast, you get really hot, and your blood feels like it's dividing like oil and water inside your veins? Yeah, that was me a couple nights ago. The fact that I could start my own small town populated solely by people named Dawn Simon was a wee bit unnerving. Not to mention creepy. (If any of you write Twilight Zoney stuff and you'd like to take that idea, I'm willing to play one of the townspeople if you'll plug my blog and help get me to the first page of Google. Hee! I am kidding. I think.) Note to Scott Perkins: I'm feeling your pain. See, I met Scott at the Pacific Northwest Writers Conference, and he said there are Facebook groups of people who share his name. *Go to a bookstore and find where your books will be shelved. Would the pen name bring you closer to eye level or farther away? *Bounce it off someone in the industry--an agent, an editor, or a successful author. I hope I don't sound negative--there's clearly a fun side to pen names, and I'm glad I'm trying out mine. After YA, my second love is MG, so I may end up using both names in the future. Who knows? My point is, changing your writing name is a big deal, and you'll want to give it plenty of thought. That said, what really matters in the big picture: our writing. Do you have anything to add to my list of things to consider, any places where you disagree, or any other thoughts on pen names? I've decided to write under a new name. Actually, it's an old one since it's my maiden name: Dawn Simon. You likey? I hope so. I'm still Dawn VanderMeer in "real life", and I'm still happily married. No need for Internet rumors! Hubby Jim fully supports this, if you're wondering. Changing my writing name was a BIG decision. And a hard one--I like both names. The thing is, I've contemplated this quite a bit over the last few years. I finally made a pros & cons list, and each side had quite a few points on it. But the pros won. One pro-change reason: Simon is easier to remember and spell, which is good for a business name. I get a lot of "Vander-something", VandeMeer, or Van Der Mere. You can't really mess up Simon without trying. Also, I now get an extra link to my parents and my brothers. I haven't been Dawn Simon since Jim and I got married eighteen years ago. It might be fun to have one name in my personal world and one name in my writing world. A little like Miley and Hannah Montana, only I'm not a teenager, I can't sing well, I'm not famous, and I don't have a secret identity. I did say a little. You may even think I look like Miley Cyrus if you squint, tilt your head, and get your eyes dilated. We both have legs. And heads. Once I knew I'd eventually change my name, sooner seemed wiser than later. Every year, I meet more writers, agents, and editors. And then there's the Internet presence we're all supposed to be building. Why build under one name and then switch? 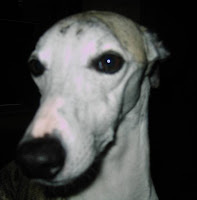 At this point, I don't even want to switch blogspot addresses because I'm afraid I'll lose some followers. With "dawnvandermeer" still in the blogspot URL, I hope I don't confuse people. Jim set it up so if you type www.dawnsimon.com or www.dawnvandermeer.com, it will take you to my blog. He really is a computer guru. Have you ever thought about writing under another name? If you did, what would you choose? Let me start by telling you about Field's End, a local writers' community I've been involved with for approximately seven years. (If you click on the Field's End link, read the part titled "Our History".) It's a volunteer-based organization with a core team of individuals at the helm who make amazing things happen. While taking classes and volunteering in small capacities (I've never been on the core team), I've met lots of writers through Field's End. A small number of the many talented people who have taught Field's End classes or have spoken at a Field's End event in the past include David Guterson (one of the founders and a member of the first core team), Susan Wiggs (a former core team member), Laura Kalpakian, Sheila Roberts (my mentor), George Shannon (currently on the core team), Donald Maass, and Christopher Vogler. Jurgen Wolff spoke on Saturday, and I was lucky to be an event volunteer. In this photo, Sheridan Bolger (the administrator for Jurgen Wolff's workshops) is on the left, Jurgen Wolff is in the middle, and I'm on the right. Jurgen Wolff is an impressive guy--very smart and willing to share from his experiences. Saturday's workshop, "Fueling the Creative Mind", was quite unique. He lead us in visualizations to help us understand our characters better. He went over story structures and taught us various writing techniques dealing with brainstorming, writing, and rewriting. He combines his background as a certified hypnotherapist and as a writer in his craft books. Here is how he sums up YOUR WRITING COACH: "It takes you from the idea all the way through to publication, and the emphasis is on the psychological aspects of writing as well as the craft." He lives in London most of the year. All of his books aren't available in the U.S., but some are. 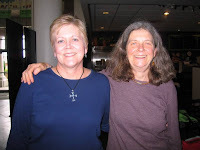 Left: Brenda Olson is a Field's End core team member and a buddy from SCBWI. 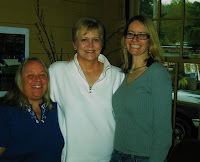 Right: Martha Schoemaker (who writes women's fiction and is one of my lovely critique partners) and Margaret Nevinski (also an SCBWI member and friend) also volunteered. 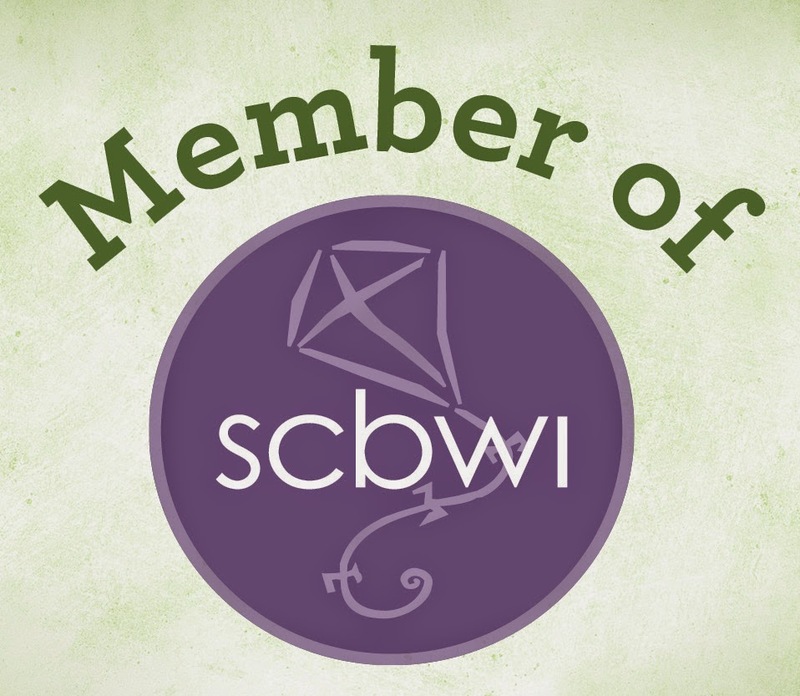 The SCBWI Winter Conference, which will be held in January, is calling to me. I want to go, I want to go, I want to go! 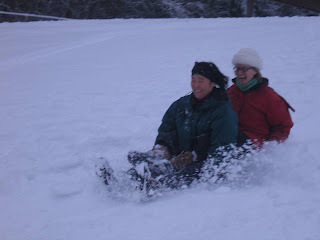 I went to the Winter Conference in 2007, and I had such a great time. I heard huge authors speak ("huge" as in reputation, not height--they were normal people, size-wise), and they were so inspirational. May I name-drop since I admit that not one of these authors is aware of my existence, thus making my name-dropping less obnoxious? Susan Cooper, Ann Brashares, Tomie dePaola, Brian Selznick, Katherine Paterson, and Jane Yolen were all there. Seriously. We shared oxygen from the same building. While that oxygen didn't taste or smell any different from the oxygen here at home (except for when I'm near my dog Thistle who has some serious gas issues), it nourished my spirit in a special way. Thistle - unashamed or unaware? Hubby Jim is thinking we might be able to swing it so I can go. It's still iffy, though. I'm crossing my fingers! Oh! I haven't said where the conference is held. New York City! I only had about two followers at the time, but I posted about how much I love New York back in June. Have I mentioned how badly I want to go to this conference? And to the SCBWI Summer Conference? They're my dream conferences. If you could hear any writer (still living) in your genre speak, whom would you choose? Saturday was the Blogging 101 for Writers class that I'd mentioned a while back. It turned out, it wasn't just writers who signed up; it was beginning bloggers with various backgrounds and plans for their future blogs. Our instructor was Tamara Sellman, creativity coach and independent editor. A member of my critique group, Martha Schoemaker, also took the class. The class was interesting for me because I use Blogger, and Tamara had us playing with WordPress. 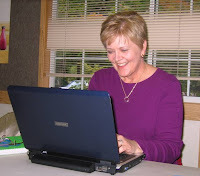 Tamara is big into blogging and uses both Blogger and WordPress (she has more than one blog), so she is an ideal teacher. She said an advantage of WordPress is it can be used as a content management system. Not being a techie myself, that meant nothing to me until she explained a content management system allows you to have static pages. An example of a static page might be a page on an author's Web site that shows the covers of his or her books. We started our own sandbox blogs (experimental blogs) just so we could mess around with and learn the WordPress capabilities. I definitely see some pretty neat things about WordPress. One is that WordPress is integrated with Akismet, a nice spam-fighting tool. But I really like Blogger too. Both are free and easy to use. WordPress has upgrades you can pay for, but since these upgrades aren't anything that I need now, I can get what I want out of either one for free. Both offer beautiful templates. I won't compare lots of features (Blogger vs. WordPress) because I'm not qualified. Still, I wanted to post about this because as bloggers, I think it's good to be aware of our options. Anyone can start a sandbox blog (it doesn't have to be made public--it's only for you to learn with) in order to get a feeling for what else is out there. While my husband is a computer guru and willing to be my 24/7 tech support hotline, I am someone who is not tech savvy. If you have more info you'd like to pass, feel free to do so in my comments. Otherwise, tell me if you use Blogger, WordPress, or whatever, and say how it's going for you. I'm sticking with Blogger, at least for now. I like it, it's easy, and I'm comfortable here. I've been thinking quite a bit about community this week, specifically the writing community. We're a special group--very unique. Lots of local writers--published and unpublished--have helped me. While we continue to hear about the competitive, tightening market, I regularly see writers helping writers. Of course you see it, too, at conferences, on blogs, or wherever. It's all around us: writers giving tips, helping with pitches, editing query letters, offering encouragement--people in various stages of their careers trying to help others move up the ladder. Yes, we also see or hear about the aggressive writers who chase agents or editors into bathrooms and elevators, but I think that's only a small percentage of us; most of us know better. Whether writing friends are critique partners, fellow bloggers, or people we've met at conferences and workshops, they just get it, don't they? They understand the ups, the downs, the investments of heart and time--they get it all because they're living it too. The camaraderie reminds me of what my hubby and I experienced in the military community when he was a Naval officer. And just as spouses and children are part of the military community, our spouses and children are part of the writing community. Then there are people like Debra, one of my closest friends. She isn't a writer, but she's right with me in the thick of everything. When I was submitting, she'd ask about whom we were querying. She's a true friend. While discussing the writing community, let's not forget the agents and the editors. I'm a positive person, but I get really irritated when people have a writers vs. agents and editors--"us vs. them"--attitude. The agents and editors I've met have been kind to me. One agent who rejected a manuscript (that's now in the drawer) offered to have a follow-up phone call with me. As you know, that's huge because agents are some of the busiest people on the planet. When I thanked him for his time at the beginning of the call, he said, "My time isn't worth any more than your time, Dawn." We spoke for over half an hour, and he let me pick his brain about his thoughts on my manuscript, on the market, or whatever. Amazing guy. Regardless of who eventually signs me, I will always be a fan of his, as an agent and as a human being. You've all probably already discovered the blogs of Nathan Bransford and Moonrat. They're great examples of industry professionals in the writing community who have a lot of heart. If you want evidence, click on the posts I linked to their names. They totally get it, and I'm happy they're in our community. And so, bloggy friends, thanks for being a positive part of my writing community. I hope I'm giving as much as I'm receiving. 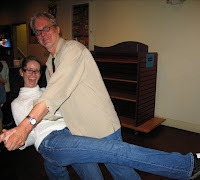 I went to an uber fun book signing on Saturday. 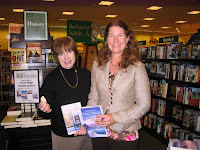 My fabulous mentor Sheila Roberts was signing with #1 New York Times bestselling author Susan Wiggs. They're best friends, they're in the same critique group, and they're both extremely talented. Plus, they're just really nice people. I bought Sheila's ANGEL LANE and Susan's LAKESHORE CHRISTMAS. I won a gift basket, nibbled on homemade yummies, chatted with friends, and walked away with two new books. Definitely a great day! Every page matters, but think about the importance of that first page. And it's not even a full page! Talk about pressure, right? Have you heard how long an agent or an editor will give a submission before deciding whether to reject it or request more material from the author? Answers vary, but I usually hear it's not long. It sounds unfair, but it isn't. Challenging for the writer, yes. Unfair, no. It actually makes sense. When you're at a bookstore and you pick up a book by an unknown author (what most of us non-celebs start out as), how long do you give it? People buying books won't wade through forty-seven pages, waiting for the good part--not even if they happen to know an author worked really hard and is rumored to be a lovely person who nurses sick cats back to health in her spare time. We have to snag them right away, and hooking them is easier said than done. Of course, "them" = prospective agents, editors, and eventually future readers. I've been to quite a few first page sessions at conferences and workshops where attendees' first pages were critiqued by agents, editors, and authors. When it was agents and editors doing the critiquing, they sometimes shared whether they would go on to page two if the work had been a submission. *One editor said he almost always reads beyond the first page. *One agent said she often stops at one page. *An editor said he sees too many stories that start out with a child being forced to spend the summer with a relative. *One person said too many interjections create a choppy reading experience. *One agent appreciates small details in the story. *More than one person said to avoid starting the story with the protagonist waking up. Apparently, they see a lot of that in children's book submissions. *Most of the editors and agents weren't wild about prologues. *One editor said she likes a hooky opening line, but not something super bizarre. *One editor said she stops if the protagonist is giving too much description, allowing her to see the author plotting. I don't know if these comments are helpful without the first page samples, but I hope they are. Something nice about being there in person was gauging my own taste, imagining myself as the agent or editor being queried. Certain first pages intrigued me and told me the person who wrote them had real talent and experience. I think those things do show up on the page, and pretty quickly. That motivates me to try my hardest to make my own pages shine. It makes sense that so many agents' submission guidelines request the first three to ten pages with the query letter, doesn't it? If I were an agent, that's what I'd do. I went to a session at a conference where an editor who had earlier critiqued our first pages read aloud the first pages of books she'd acquired, books that are coming out this year. It was fascinating. Now I find myself paying extra close attention to the first pages of my favorite YA books. It's so inspirational. And just think...all of these books' authors started out like us, unpublished but working hard to make their dreams come true. Do you have any first page tips? They don't have to be for YA/children's. We're a mixed group, and I think that's cool.